Something happened today which is completely unexplainable and for most of the day had us, well, baffled. 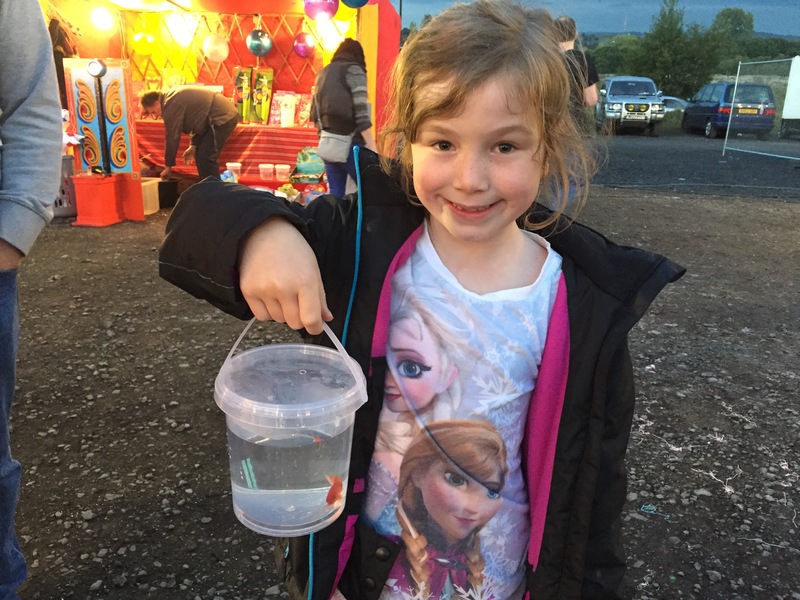 A week or so ago the munchkin won a goldfish at a fair. She hit the bell on one of those hammer test of strength things. The guy was all, ‘don’t worry if you don’t ring the bell, prize every time.’ She looked at him like he was talking utter nonsense swung the hammer and rang the bell first time with little effort! Which got her a cheer from us but quite why we let her pick a goldfish out of all of the tat that was on offer and binable is beyond me. I blame her dad on this occasion. We already own a goldfish that is well over 5 years old and has the ever so original name Goldie. I know, I didn’t think they lasted that long either, I’m sure I was up to Rocky 9 before a year was out, I’m also not quite sure how this particular one has lasted so long. Owning Goldie does mean we have all the bits needed for goldfish care. We decided to keep the fish separate, the fair fish started getting some black spots and we didn’t want it infecting dear Goldie and we weren’t sure how he’d react to a new bowl mate. Not yet decided on a name Fair fish remained in his tub at the side of the ‘tank’ (tank used very loosely here) we promised the munchkin that if he lasted, with the black spots, we’d get an additional bowl, we had already warned her that fair fish don’t normally last so long. This morning I went to feed both fish to find fair fish was missing. Not in its tub. Vanished, disappeared, gone. I stared into it for quite some time trying to work out what the hell was going on! We don’t feed the fish everyday and the last time I remember seeing it personally was Saturday. I also stared into Goldies tank to check it hadn’t been put in there. Nope! The bloody thing was no where to be seen. I called to Mr C, he was as confused as me. The tub was empty and there was no fish on the kitchen side either. He even googled whether fish can just disintegrate, they can’t. The only logical explanation was that it had somehow jumped out, we just couldn’t understand where it had gone. Every so often during today we’ve asked out loud to no one in particular ‘I wonder where that fish went?’ There may have been some teasing of the munchkin with a leftover roasted carrot from last nights tea. She was not amused. Tonight Mr C was looking for something or other and went into the bit drawer. Every house has one, ours *may* have more than one. The particular drawer in question is positioned underneath where the ‘tank’ and tub have been kept. I could see Mr C lean into the draw and sniff and then lean over the tank and sniff. Odd, you’ll agree. He called me in to the kitchen and asked me to do the same and sure enough the drawer smelt fishy, the tank in comparison did not. I quickly removed myself from the situation, I’m not a fan of, well the discovery of dead goldfish. The munchkin stayed, trooper, and helped her dad sniff out where in the drawer was the strongest smell and sure enough under a screwdriver next to some aa batteries we aren’t sure have charge and on top of Mr Cs swimming goggles lay fair fish! Mystery solved, sort of. We’ve still no idea how it got into the drawer, even if it had managed to jump out of its tub, the position from the edge to drop into the drawer is a mega distance for a goldfish to flap to. I’m not sure we’ll ever really know what happened, with no witnesses. The only thing sure in all of this is we’re now back to owning just one 5 year old goldfish! Oh my goodness! What a bizarre thing to happen! I would definitely have had to step away from the drawer too. We might even had to call my dad to help! It has been a bizarre week all round to be honest. Still no idea how it got to where it ended up! What a strange incident!! My sister won a fish at a fair a couple of years ago. We have a pet cat… lets just say the fish didn’t last 5 days!